Her Ring Together as One His Ring. This stunning new creation of His and Hers Wedding Rings are hand crafted in beautifull precious Hallmarked 9ct Yellow Gold with 9ct white Gold heart. Highly polished by hand to a mirror finish. When placed together they create one Heart. Each piece is hand inspected before dispatch so you can be sure you will receive the highest Quality Jewellery available. All my jewellery is fully UK Hallmarked which is your guarantee of the quality of gold used. Available in a combination of ring widths 4mm / 6mm / 8mm Please select from the drop down boxes at the top. J to Z. Half Sizes Available on Request. 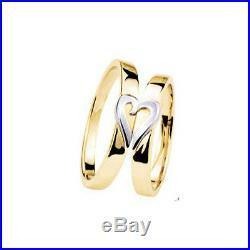 Metal – 9 carat Yellow Gold Rings with 9 carat White Gold Heart. Gold Weight -Average dependant on finger size and width selected. Between 8 and 16 grams per set. We could list the weight of the ring at the largest finger size. We could cut corners, cast the ring, then barrel-polish. It’s easy to throw together a cheap, heavy wedding ring and increase the’perceived value’ in doing so. That is certainly NOT our style and surely other websites and jewellers wouldn’t do that would they? Casting a wedding ring is so much cheaper than spinning, milling or turning one. Our wedding rings are spun, milled or turned. It would be a lot cheaper to barrel or machine polish rather than buffing by hand working down through 5 different grades of emery paper, reducing the grade at each procedure until you reach the finest grade paper, and then hand-polishing as we do. Our craftsmen are not going to stop polishing when a ring reaches a specified weight, they will only stop when they reach that mirror bright finish that we have become recognised for. We’re proud of the wedding rings we make, they are made with care and are a cut above the rest. Each one is made especially for the bride or groom and they will be the only person to have ever put it on. All rings are delivered in a free luxury ring box. Please allow 10 days for the making of these rings as they are handmade to order. Welcome to Get your Roks on. I have a collection of my own Jewellery but along the way I have found some great pieces by other designer/makers and companies which I. Have added on, giving an eclectic mix of contemporary jewellery. I have tried to provide pieces that are unusual, as well as more conventional everyday pieces. The jewellery is made using materials of the highest quality including White and Yellow gold of all carats, Platinum and precious stones. We only ask our customers to abide by the same rules. The item “His and Hers Matching Wedding Ring Set 9 CT Band 4mm 6mm 8mm all sizes” is in sale since Friday, October 28, 2011. This item is in the category “Jewellery & Watches\Fine Jewellery\Fine Rings\Precious Metal without Stones”. The seller is “get-your-roks” and is located in West Midlands. This item can be shipped worldwide.